Buy Natures Plus Source of Life Garden ® - Women's Once Daily Multi 30's in the UK from our online shop or directly from our independent Scottish store. Natures Plus Source of Life Garden ® is a unique range of whole food based multi vitamins. Specifically designed for women, this organic multivitamin revitalizes mind, body and soul. Natures Plus Source of Life Garden ® multivitamins harnesses the power of fruits and vegetables, delivering high quality vitamins and minerals without pesticides, synthetic chemicals, yeast, allergens or other toxins. This women's multivitamin has a ORAC value of 30,000 and contains 10 portions of your daily fruit and vegetables! All of that in an easy to take one-a-day tablets! As official Natures Plus stockist, we sell genuine Multi-vitamins directly from our shop in Scotland and online throughout the UK. Where can you buy real Women's Once Daily Multi safely online? 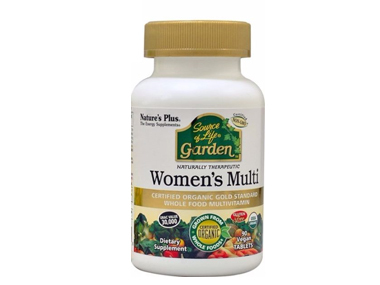 If you are wondering where you can buy Natures Plus Source of Life Garden ® - Women's Once Daily Multi 30's safely online in the UK, then shop with us. We are an actual health foods shop; with real people selling real foods and products. Our award-winning independent shop is located in Stirling, Scotland since 1976. You can buy our Natural Vitamins and Nutritional Supplements and other genuine Multi-vitamins in store or safely place an order with us online or over the phone. Women's Once Daily Multi - Natures Plus Source of Life Garden ® - Women's Once Daily Multi 30's in Multi-vitamins and Vitamins and Minerals.